What's worse than doing laundry? Doing laundry while surrounded by 4 walls of multi-colored clothespins. It wasn't just that they were hard on the eyes. It was that they were sending me subliminal messages. Even if I walked through the mudroom carefully averting my eyes from the large white appliances, I couldn't avoid eye contact with the clothespins. Everywhere I looked, there they were... staring at me, taunting me, making it impossible for me to forget that there were piles of laundry awaiting my attention. I simply could not have my wallpaper applying that kind of pressure. 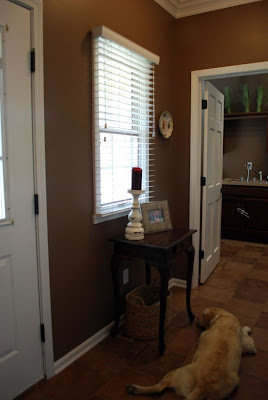 In keeping with our theme of "hiding the dirt," I chose a paint color that would camouflage fingerprints and whatever other messes made their way onto the walls. So, the clothespins came down and the paint went up. We continued the paint into the side-entry hallway. This is the view from the hallway looking into the laundry/mudroom. Again you can see my exemplary staging techniques. Just keeping it real, folks! There's still lots to do in this area of the house, so I'd better get busy. Coming soon: a countertop and sink makeover. Hope your day is dirt and laundry-free! Great job Carolyn! Nice area for storing jackets and book bags and I LOVE the color. Aw but the clothespins were so cute and chic in their own little way! Looks awesome. Hope it works out better for you! OOOHHH I have so much laundry. When I did my new laundry room post I did close up shots and moved the piles. You do look neat and organized though! PS Love the paint color, too! I really enjoyed the paint color but I am more impressed with your dog. She seems so well behaved and docile. You are one lucky girl! it looks great-that was SOME wallpaper! I love that you're "keeping it real" - it looks great! Thanks for following our blog, we've returned the favor (enthusiastically, I might add). Hope you're having a fabulous week. I'd say what's worse is doing Landry while your mother yells at you that your doing it wrong.